I have been asked where I get an idea for a novel. 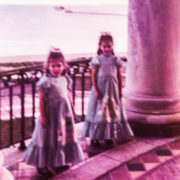 Four years ago, while rummaging around in the basement, I found a faded photograph of two pretty young girls. It launched a new life for me. The young girls in the picture are my daughters, Julie and Jancy. The occasion was a 1974 photo shoot for a Foley Bros. Department Store print ad. The setting for the shoot was the Sterling Mansion on Morgan’s Point. Gazing at the picture of my daughters standing on the back portico of the mansion overlooking Galveston Bay engendered a father’s pride, but was also the inspiration for a story about a young lawyer living in this house. I’d like to say that in the next 60 days I completed Morgan’s Point, but in reality I was blessed to get it published in paperback on Amazon and ebook on Kindle in 2016. I recently completed a novel entitled Anahuac that continues the journey with lawyer Jim Ward and his wife Cooper Faircloth. Anahuac is a sometimes funny story about serious topics as diverse as rural justice, radio religion, and the changing role of women in the 1970s. In 1968 Virginia Slims cigarettes created an ad campaign around the slogan, “You’ve come along way baby!” (Was that ad written by a man, baby?) If you’d like to see how far we’ve come from the 1970s, Anahuac is illuminating. The two young girls in the photograph certainly were blessed with more opportunities than the women in the workforce in those days. 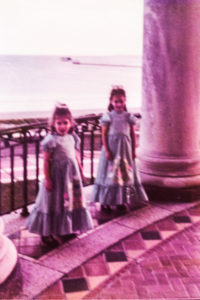 The Sterling Mansion shoot was the first major modeling opportunity for my daughters. I had a Kodiak Brownie Hawkeye camera, but in the excitement of the day shot only the picture you see here during a break. I regret not taking more pictures because the mansion has been greatly refurbished in the last few years. Back then, there were no cell phones or digital cameras to snap fifty shots at will. I had seen the mansion many times from the water while sailing on Galveston Bay. The bay side of the mansion is modeled after the back of the White House in D.C. It surprising to see such an architectural feature while gliding around the bay. There is a picture of the mansion in the Virtual Tour section of my webpage. The builder of the mansion was Ross Sterling. Mr. Sterling was a founder of the Humble Oil Company and also served as governor of Texas. The mansion was not his family’s primary residence. The mansion was built as a summer home to escape the oppressive heat and humidity of Houston’s summers. Mr. Sterling’s “cottage” is over 20,000 square feet, similar to those located in Newport, R.I. Today the mansion is in private hands, but can be viewed from the road. Muse comes in surprising packages. When I was blessed to find the long ago photograph of my daughters on their special day it rekindled my curiosity about life in the Sterling Mansion. That curiosity resulted in the inspiration for Morgan’s Point and now Anahuac. Anahuac is the sequel to Morgan’s Point, but may be read without having read my first novel. Anahuac is scheduled for release this fall.